When a child in your family has the flu, here’s how to help him or her recover and help protect other family members. 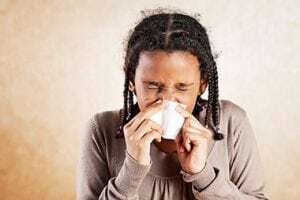 When possible, keep family members who are well away from the person who is sick. Wash hands frequently or use plenty of alcohol-based hand sanitizer, especially before touching your face. Clean faucets and other shared surfaces with standard household cleansers. Use paper towels instead of hand towels in the bathroom and kitchen. Call your doctor’s office for advice if you notice any of the following: a fever lasting more than four days, fever occurs with a rash, fast breathing or trouble breathing, bluish skin color, not drinking enough fluids, the child has no tears when crying, significantly fewer wet diapers, is unable to eat, not waking up or not interacting, being so irritable that the child does not want to be held, or if the flu symptoms improve then return with fever and worse cough. You can ask your child’s doctor to prescribe an antiviral medication. Especially when taken in the first 24 – 48 hours after the symptoms started, it can help your child recover more quickly. Antibiotics don’t help with flu. Check non-prescription medications carefully. If you give your child acetaminophen (Tylenol) for fever or achiness, be sure that any other medications don’t also contain acetaminophen. Remind children to cover their cough. Your child should be fever-free for at least 24 hours before returning to school. It will be important to still get enough sleep and not overdo right away. There’s still time for other family members to get a flu shot that will provide some protection against exposure to flu at school and in the community. Persons who have already had the flu also can benefit from getting a flu shot since there are at least four different types of flu going around. You may have heard that the flu vaccine is only 10 percent effective this year. That’s just not true. The effectiveness of the vaccine for this season will not be calculated by the Centers for Disease Control until the end of the flu season. The 10 percent came from Australia’s flu season last summer, and that was only the effectiveness of the vaccine against a single strain of the flu. It was over 50 percent effective against the other strains of the flu. Furthermore, effectiveness is defined as the proportion of vaccinated people who develop the flu. The vaccine effectiveness number says NOTHING about the ability of the vaccine to decrease the severity, the risk of hospitalization, or the risk of death in those who are vaccinated. Vaccinated persons are generally less sick than unvaccinated persons when they get the flu. They are less likely to be hospitalized and less likely to die. Next post: May I Have This Dance?